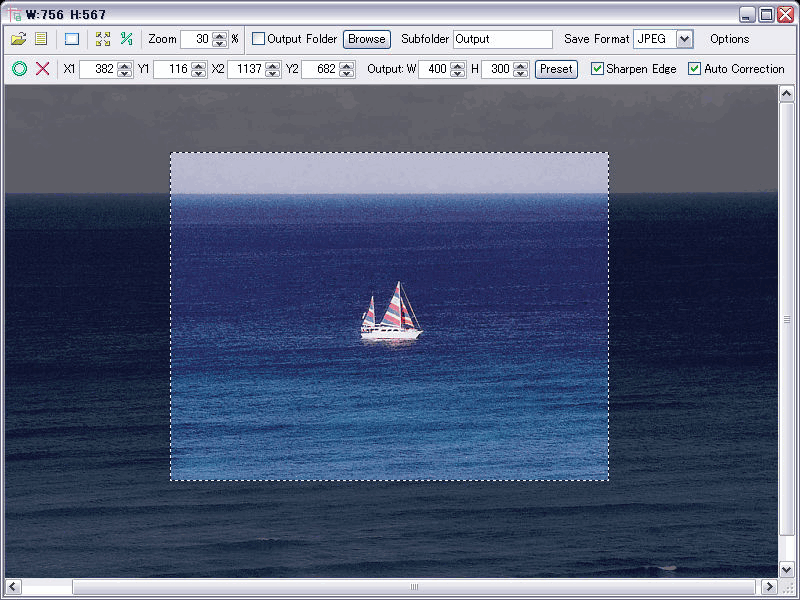 Trimto is an image editor to crop, resize, and save in one operation. The program focuses on standard-sizing and a set aspect ratio. Optionally, "Sharpen Edge" and "Auto Correction" can be processed simultaneously. Useful for quickly reducing the size of photos with unnecessary borders or lots of activity on the periphery (e.g. distractions like flags, crowds, power-lines, etc.). Includes sizing presets and output size details to file name. Input and output formats include PNG, JPG, TIFF, GIF, and BMP. Please ignore last comment. Latest version allows free rectangle. Thank you, Trimto! Totally agree with webfork. A great little utility, but the ability to draw a freehand rectangle would be fantastic. Nevertheless, it's still a keeper! Cool program, but wish I could just do a free mouse crop (draw a rectangle of any size or shape) on this program to crop.